Mayor Jim Kenney named Philadelphia’s first nine community schools Monday, officially launching his five-year plan to create 25 such schools. 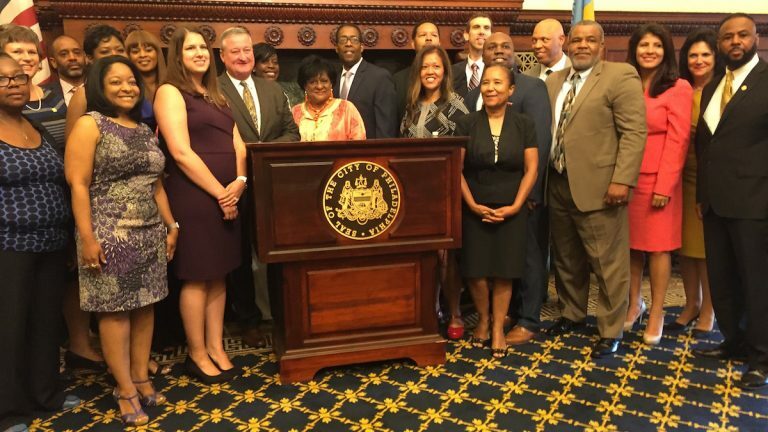 The initiative was rolled out with much fanfare at a City Hall press conference that reinforced the central role community schools will play in Kenney’s K-12 education agenda. “I firmly believe that when we help our schools become stronger, our neighborhoods will get stronger, and this makes for a stronger city,” said Kenney. The nine schools in Philadelphia’s inaugural class of community schools are: Murrell Dobbins CTE High School; William T. Tilden Middle School; Kensington Health Sciences Academy; South Philadelphia High School; Edward Gideon Elementary/Middle School; Southwark Elementary/Middle School; F.S. Edmonds Elementary School; James Logan Elementary School; and William Cramp Elementary School. 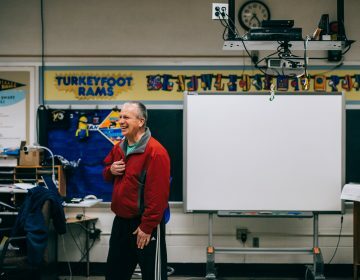 Together, the schools represent a wide cross-section of neighborhoods — from gentrifying South Philadelphia to some of the city’s poorest ZIP codes. Community schools as a reform strategy are a concept pushed by Kenney with the support of City Council President Darrell Clarke and a coalition that includes the teachers union and several education advocacy groups. It is essentially the answer to the predominant school reform strategy of at least the past decade — the “portfolio model” that’s led to the creation of more charter schools. The community schools approach calls for schools to become neighborhood centers for support services, almost like a cross between traditional schools and community centers. The central argument is that children — especially low-income children — face steep barriers outside the classroom that prevent them from learning, and that schools must address those barriers in order to eventually drive achievement. Philadelphia is paying for its community schools initiative using money generated by the sweetened-beverage tax, approved by City Council in June. Council set aside $4 million to fund the project this year, with more to come as the city rolls new schools into the mix, and the real cost of integrating and expanding city services becomes clear. That works out to a little over $400,000 per school, although schools aren’t guaranteed a certain allotment of cash. Instead, each community school will receive a site coordinator responsible for assessing community needs and finding resources to help meet those needs. Nearly half of the $4 million — around $1.6 million — has been earmarked for personnel. That includes the site coordinators and technical support staff who will work out of City Hall. Contracted services account for another $1.75 million, with just $400,000 total set aside for materials, supplies, and equipment. City officials said they hope the site coordinators will turn community schools into magnets for outside dollars. 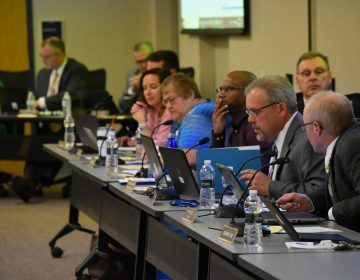 “That will include balancing what philanthropic resources are available, what corporate partnerships are available and what we’ll look at is what programs we need to expand in order to be able to get these services,” said Susan Gobreski, director for community schools with the mayor’s office of education. The mayor’s office has been vague when explaining how it will measure the success of its community schools initiative. It has vowed to de-emphasize — if not outright ignore — student test scores when evaluating the program. Officials have pointed instead to measures such as daily attendance and neighborhood buy-in. The city has also downplayed expectations in year one, describing it as a time to coordinate plans and make sure new initiatives are being rolled out with fidelity. Representatives of the state Department of Education were also present at Monday’s announcement, indicating a state interest. Beth Olanoff, policy director for the department, said that Secretary Pedro Rivera is a “strong supporter” of the community schools strategy. “Too often, we have opted to close or give away our neighborhood schools instead of actively working to remove the obstacles that stand between our schoolchildren and academic success,” Jackson said. 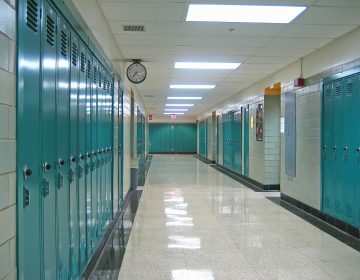 And the Philadelphia Coalition Advocating for Public Schools, also a longstanding community schools proponent, issued a statement calling the strategy “transformative” and praising the geographic diversity of the chosen schools and and the commitment of the leadership in each one. “I don’t think this is a complete solution to all our problems, but it will put us on a trajectory to build better families, better communities,” Damon said. “I’m standing here composed, but on behalf of my colleagues, I’m super excited,” she told the gathering. For instance, this year one of her students was shot, which traumatized other students in the school. “Families didn’t know where to go, so they came to me for help,” she said. By making calls and reaching out, she was able to get extra counseling services. And while the student, thankfully, survived, he actually came to school the next day, which raised its own red flags. Damon felt strongly that he should be home recovering. So she took him home herself, talked to the family, and tried to get to the bottom of the incident, which she suspected was related to gang activity. Dobbins, located at 21st and Lehigh, is a citywide Career and Technical Education high school where students must apply and meet certain criteria to get in. As such, it may seem like an odd choice for a community school. But it isn’t, said Gobreski. For one, as Damon’s story indicates, its students have many intense needs. One of the city’s original “vocational” schools focusing on trades, it is housed in a seven-story building meant for thousands but now has barely 600 students. It was chosen in part because expanding access to and increasing the quality of CTE, as it is now called, is another priority of the Kenney administration, Gobreski added. And even though its students don’t all live in its surrounding area, Dobbins “still plays a role and has relationships in its neighborhood,” she said. The school “has challenges that they need help with, and the neighborhood certainly needs help. What we were looking for places that were demonstrating the capacity to do this, opportunities for neighborhood growth, and where this type of strategy can play a role.” Increasing the school’s enrollment by making it a more attractive place to attend was also a consideration. Shauneille Taylor, principal of the 328-student, K-8 Edward Gideon Elementary School in the heart of North Philadelphia, said she is thrilled. Now, she said, she has to make phone calls and scout around for help when her students, for instance, come to school hungry, which is not a rare occurrence. Her families “need behavioral health services, help with parenting skills, information on how to get a GED,” Taylor said. Making schools community hubs and social services in severely poor areas like Gideon’s will go a long way toward “leveling the playing field for all students and breaking the cycle of poverty,” she said. Some of her families also lack adequate health care, she said. At her previous school, one of her students was found to suffer from sleep apnea. At Gideon, she was able to bring in experts from Children’s Hospital of Philadelphia to train her staff to recognize symptoms of the condition in children. As a community school, Gideon will be able to make such training and programs routine and in-house.